Thanksgiving is a great time to share a traditional meal with family and to give thanks. This is a time where most people are probably not thinking about their eye health. 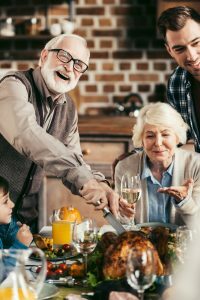 That being said, many of the foods served in a traditional Thanksgiving feast actually promote good eye health. These staples are rich in nutrients that contribute to healthy arteries, which in turn supply the eyes with oxygen and other needed resources. It is clear to see that many of the staples that families already serve at Thanksgiving promote good eye health. Talk to our optometrists at Eye Care Associates for advice on additional foods that help contribute to the overall health of your eyes.